I have to do this post quick for our niece Dang who needs the recipe tonight. This is adapted from my most worn out cookbook (meaning a favourite and I do need a replacement since it's literally falling apart) - Let's Cook with Nora by Nora Daza. 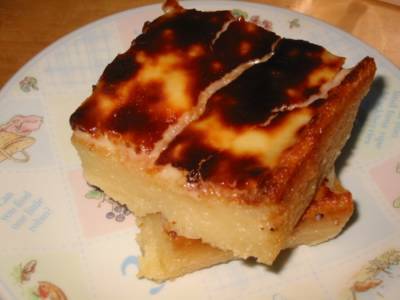 The recipe is titled Nena Zafra's Cassava Bibingka but I have to make a lot of adjustments because I find the cake too rich and the topping much richer still. So I toned it down a lot but left the topping as it is. I baked it in bigger pans and at longer time. Result? A best seller in every Pinoy gatherings and very popular at balot or pabaon time (the Pinoy predilection for having take-home bags of food upon leaving a Pinoy party - how's that for a double whammy?). The cake is easy to make while for the topping, you do have to *constantly* stir the sauce while cooking because it burns very easily. Use the 'flour for sauce' for this one if you have access to it. Here in UK it is available in any supermarket flour section. I think it is formulated with less gluten so it will not form lumps when added to sauces. Which is heaven sent for us hapless cooks. It really does not form lumps as per my experience but still retaining all the thickening properties of a regular flour. Preheat oven at 350F/180C/gas mark 4. Pour in a greased 13 x 9 inches pan or three 9-inch square pans. Bake for 1 hour or until a toothpick inserted in the middle comes out clean or with moist cassava instead of wet batter. Combine the first four ingredients in a heavy based saucepan and bring to boil while stirring constantly. When thick, remove from heat and pour the egg yolks in a thin stream. Make sure you are stirring quite fast otherwise the egg yolk will coagulate and would not blend well with the sauce. Bring back to low heat and cook for 1 minute, still stirring constantly. Spread on top of the cooked cassava cake and broil/grill at 400F/200C for about 5 minutes or until top is golden brown. *Note: The reason why water is added is to dilute the coconut milk because most of the canned ones I buy here are very thick almost like coconut cream. So if your coconut milk is quite thin or the 'normal' one, then put in 2 x 400 ml of it.